to nurture hope, creativity, and a love for life. 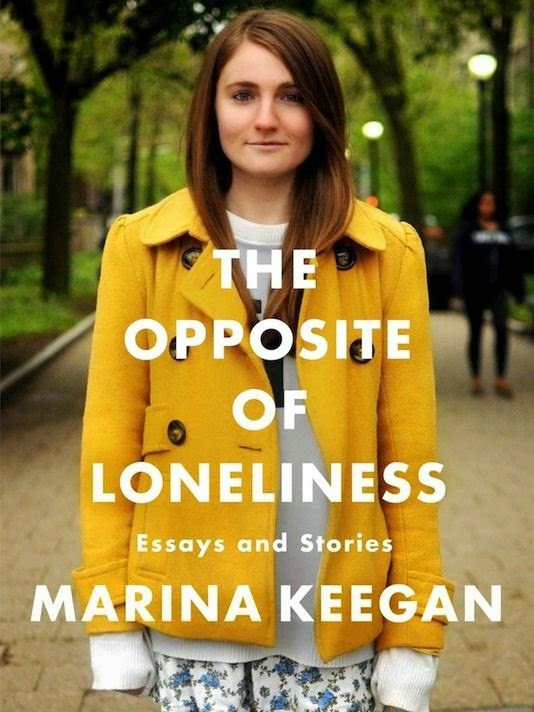 Marina Keegan’s story is a tragic one: five days after graduating from Yale with great prospects ahead of her – including a job at the New Yorker and a play to be produced at the New York International Fringe Festival – Keegan was involved in a fatal car accident. Although published under terrible circumstances, The Opposite of Loneliness is a celebration of the written legacy that Marina left behind, and the book’s greatness is in the hope that it offers. “What we have to remember is that we can still do anything. We can change our minds. We can start over…We can’t, we MUST not lose this sense of possibility because in the end, it’s all we have”. Something that we’d all do well to remember, regardless of age. “Even Artichokes Have Doubts” has a similar message, questioning the 20% of Yale graduates that are destined for careers in consulting and finance despite their ambition and initial plans (arguably because it is a more accessible option than finding fulfilling work in non-profits and creative industries). I want to watch Shloe’s movies and I want to see Mark’s musicals and I want to volunteer with Joe’s non-profit and eat at Annie’s restaurant and send my kids to schools Jeff’s reformed and I’m JUST SCARED about this industry that’s taking all my friends and telling them this is the best way for them to be spending their time. Any of their time. Maybe I’m ignorant and idealistic but I just feel like that can’t possibly be true. I feel like we know that. I feel like we can do something really cool to this world. The encouragement from a twenty-two-year-old to put creativity before money is perhaps an unusual one, but an important one. Likewise, Keegan’s short stories “Cold Pastoral”, “Winter Break” and “Hail, Full of Grace” act as clever reminders to nurture our family bonds. “Hail, Full of Grace”, my favourite story in the collection, has Keegan’s literary talent on full show. There’s loneliness, jealousy, and mourning for what’s passed in the story of Audrey, a woman who returns – with her newly adopted baby – to the town she grew up in, faced with the memories of what has passed and the baby she lost in her twenties. Keegan’s writing isn’t always perfect (it’s worth remembering that it wasn’t left in that way), but it demonstrates both hope and an exceptional awareness of life’s ultimate balance with death. Throughout the collection, Keegan is questioning “if not now, when?”, and it’s impossible to undermine the impact that this book has certainly had upon twentysomethings struggling to navigate the economic climate. However, I think it’s worth trying to avoid classifying an audience for this book. It’s easy to mourn what could have been upon reading The Opposite of Loneliness, but this well-crafted book allows us to praise the work that Keegan created before her passing. What is more, it is a book that allows us to be inspired to take action in our own lives, whatever our age: a legacy the author more than deserves for these stories and essays. "What we have to remember is that we can still do anything. We can change our minds. We can start over…We can't, we MUST not lose this sense of possibility because in the end, it's all we have." I think it would be more realistic to say that while we cannot do anything, there are a great many possible things that we can do. And we should remind ourselves of those things. We can start over. We can think in different ways. Not to do "anything", but to do a great many possible things. What those possible things might be depends a lot on the resources we have available (both inner resources and outer ones). [T]he thing is impossible not because of any intrinsic difficulty, but because it requires them to act out of character.